The look and feel of premium 100% cotton paper makes a positive impression. Note: A minimum quantity of 294 must be ordered, and in units of 6 thereafter. Southworth 100% Cotton Resume Paper, 95 Bright, 24 lb, 8 1/2 x 11, White, 100/PK - Resume paper is made of 100 percent cotton for a distinctive crispness and lasting impression. Endorsed by the National Resume Writers Association, 24 lb. sheets have a wove finish and are acid-free, lignin-free, watermarked and date-coded. Use in laser printers, inkjet printers and copiers. Resume paper includes handy resume writing guide. 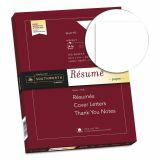 For resumes, cover letters, thank you notes and more. Endorsed by the National Resume Writers Association. Coordinating envelopes Southworth® R1410L and SOUR14I10L.